Last month, aging rocker and gun aficionado Ted Nugent, a.k.a The Motor City Madman, commented that President Obama was a ‘subhuman mongrel’. Nugent is well known for his outspoken hatred of President Obama but even this statement brought condemnation from many Republicans, even the folks at Fox News, a.k.a The Republican Propaganda Network. This outrage is justified as that particular phrase was used by the Nazis to condone the extermination of not only Jews but Slavs, Poles, communists, socialists, Roma and homosexuals. But there was one Tea Party patriot who gave the ‘Nuge’ a thumbs up. Sarah Palin endorsed Texas gubernatorial candidate Greg Abbott, by saying “if he’s good enough for Ted Nugent, he’s good enough for me”. Yes, the Republican party sure has admirable spokespeople for the future. 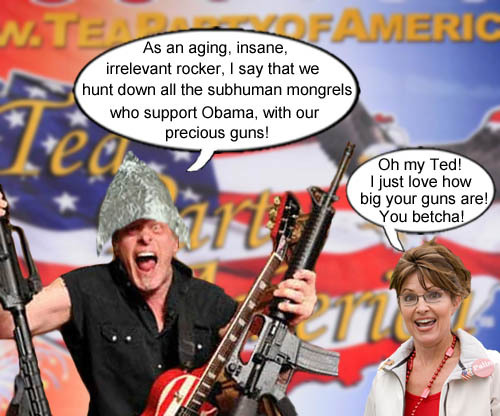 Aging rocker and gun enthusiast, Ted Nugent, a.k.a the Motor City Madman, demonstrates why he and Sarah Palin are at the forefront of the Tea Party movement in the Republican party. 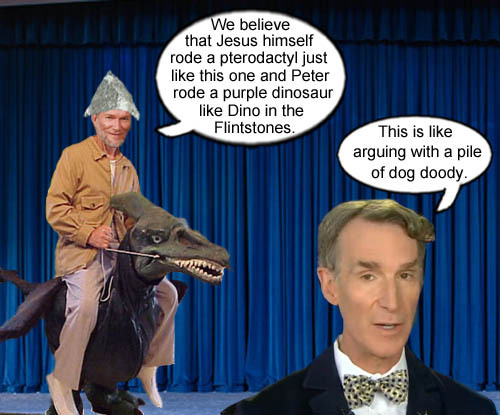 Recently, Bill Nye debated creationist Ken Ham at the Creation Museum on creationism vs. evolution. We here at the Bucket are fans of Bill Nye and we applaud his efforts to teach science, logic and reason to the American people, who in general are severely lacking in scientific understanding (80% Americans actually believe in angels). Now, we’re really impressed with him because 92% of respondents in a Christian Today poll concluded that Nye won the debate. Even conservative christian wing nut poster boy Pat Robertson said that Ken Ham should just shut up. So kudos to Bill Nye for having the patience to debate a narrow minded doofus, because if it were any of us here at the Bucket, we would have just said ‘screw it’ and thumped Ham over the head with an oversized cartoon mallet. Bill Nye realizes the futility in trying to explain scientific principles, reasoning and logic to a narrow minded clown. Former Arkansas Governor and perennial GOP presidential candidate, Mike Huckabee, recently made headlines by commenting that Democrats are trying to convince women they need ‘Uncle Sugar’ to control their libidos. 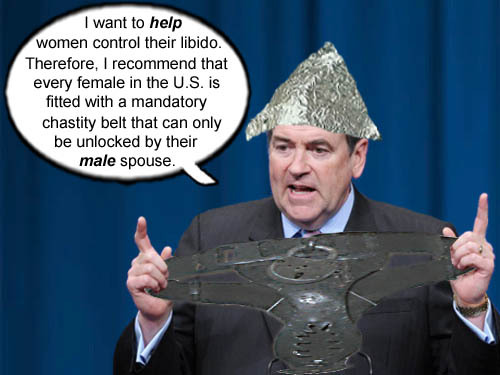 Of course, Mr. Huckabee, being a bible thumping conservative christian, prefers old-fashioned, holier methods of birth control to help women such as abstinence, prayer and a good old chastity belt. Mike Huckabee declares that it is wrong for government to control a women's libido but perfectly A-OK for the church to control it. Recently, billionaire venture capitalist, Tom Perkins, made headlines by comparing the ‘plight’ of the 1%ers to the Jews in Nazi Germany. He says that he fears a progressive Kristallnacht is coming because the 99% resents the success of the 1%. Wow! We thought the rich were out of touch before, but this is stunning. We don’t think the 99% resents the 1% for their success, we think it’s because of the plutocracy’s unabashed, all-consuming greed. But maybe Perkins is right. If the plutocrats in this country, and all over the world, keep acting like victims maybe they will get a thumping. 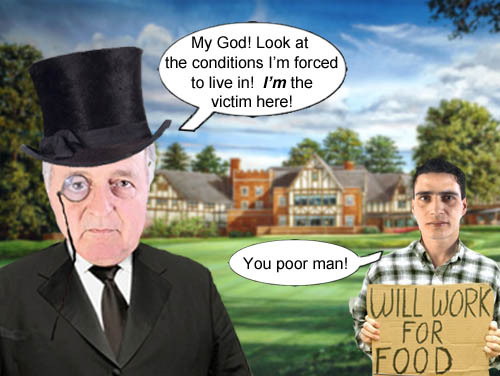 A poor plutocrat convinces a member of the ruthless 99% that it's the 1%ers who are being persecuted.